Today is the official 46th March for Life in Washington, DC. Hundreds of thousands of dedicated pro-lifers will make the trip to the nation’s capital to make sure that our elected representatives understand that we will never stop efforts to protect preborn children. Although commemorating a somber moment in 1973 when the US Supreme Court voted 7-2 to decriminalize abortion through all nine months of pregnancy, attendance at the March can be an uplifting experience. Pro-lifers can think they are a small minority—especially if they live in California or New York or any of the New England states. Then you get to DC and you see people just like you arriving by bus from all over the country. One of the first things you notice is how young the marchers are. Sure, there are the old-timers who have been in the fight for decades, but there are many more young people. Just yesterday, I was in the Renaissance Downtown Hotel—headquarters for the March activities—and I witnessed the arrival of busloads of young pro-lifers from the Archdiocese of Miami, Florida. With their blue drawstring bags over their shoulders, you could just tell that they were there because they wanted to be. The smiles on their faces were not because of what they are commemorating, but because they were truly filled with joy to be standing up for the babies. Where are you from? Oregon! How did you get here? By bus! How long did it take you? Five days! How long are you staying? We’re going to march and then go home! Another five days on the bus? Yes! Can you imagine? Fifty people from Oregon who felt so strongly about the baby killing going on in our nation that they were willing to give up two weeks of their lives just to be at the March. As you can tell, 35 years later their dedication still sticks in my mind. Now that I live in Virginia, I get to the March just about every year, but the enthusiasm of the marchers—young and old—is refreshing. It reminds us of why this event is so important. Some 60+ million preborn babies have been killed by medical and surgical abortions since 1973. Hundreds of millions more have died through the abortifacient “contraceptives” (birth control pills, IUDs, shots, and patches). The abortion advocates do not understand us. They can’t believe we are still here. They tell us to give up. They say the fight against abortion is over. And yet, every year the people come. As we gather this year, there is one very disturbing statistic that is becoming more prevalent. That statistic deals with the growing apathy of Americans towards the killing of preborn babies. Over the course of the 46 years of decriminalized abortion, various polling agencies have sought to capture the attitude of Americans about abortion. These polls generate lots of data and lots of statistics. Here we will focus on just one—what percentage of Americans think abortion should not be allowed under any circumstances. Of course, we would like that number to be 100%. The actual numbers fall far short. When a Gallup poll asked that question in a 1976 poll, the answer was 21 percent. The value fluctuated over the years, but when the same question was asked in 2018, it had fallen to 18 percent. Last year, when Students for Life of America commissioned a poll that included that question, the answer, again, was 18 percent. Towards the end of 2018, the Knights of Columbus also paid for an abortion-attitudes poll by Marist Polls, the answer to the question was 16 percent. The pro-life movement has saved millions of preborn babies over the years and for this we should be thankful to God. But, it appears we are not changing attitudes. After all this time, over 80 percent of Americans still think it is okay to kill God’s creation some of the time. As we move forward in 2019, we need to pray and ask God how we can help Him change attitudes. At its roots, abortion is a spiritual battle and we must turn to God in earnest prayer and find out what it will take to get a lot more people to see that child-killing as wrong—all the time. Judie Brown’s commentary this week, Killing Hope with Bad Medical Practices, examines the problems becoming more prevalent in the “palliative care” and hospice world. American Life League’s Twitter account continues to provide cutting-edge commentary and images. One of our tweets was used in a Breitbart story about the March for Life this week. American Life League’s Facebook page promoted participation in the March for Life this year with this post on Why We March. Abortion regulation bills erroneously labeled as pro-life are cropping up all across the country. Jim Sedlak, executive director of American Life League, reminds a group of protesters in front of a Planned Parenthood facility in Washington, DC, that our core mission is to never leave a preborn baby behind. Although the March for Life in Washington, DC, is the largest pro-life gathering in the world, it is not the only pro-life event. The March for Life organization, the group that runs the DC march, maintains a list of other marches and special events taking place over the next couple of weeks on this website. As we were completing this newsletter, there were over 70 such events in 38 states. Running the largest abortion provider in the country must be tough work. The president of Planned Parenthood went to medical school to save lives. Now she’s leading the largest company that ends them. But – now you support death….therefore all previous efforts are now seen through this lens. You preside now over the death of 320,000 human beings a year. Each death contributes to your salary. You could do many other noble things with your talent, but you chose this. You went to medical school? To save lives? I’m sure the doctors who worked for the Nazi regime had the same sort of self righteousness for going to medical school and becoming doctors. 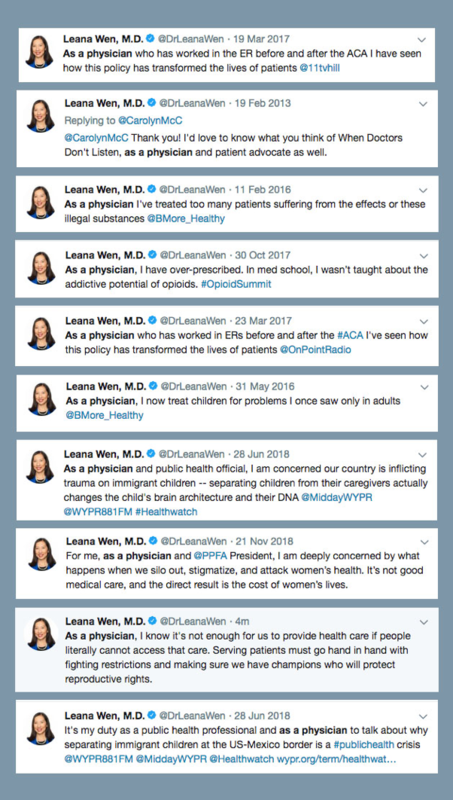 Quick fact: as the president of Planned Parenthood, she is not a practicing physician; she’s a CEO managing the decline of an abortion corporation.